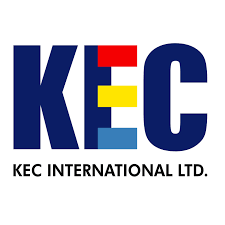 KEC International , the flagship company of RPG Group, is a global infrastructure Engineering, Procurement and Construction (EPC) major. It has its presence in the verticals of Power Transmission and Distribution, cables, railways, civil, smart infrastructure and solar. The company has powered infrastructure development in 100 countries across Africa, America, Central Asia, the Middle East, South Asia and South East Asia. KEC was incorporated in 1945 as Kamani Engineering Corporation by the RPG Group. It designs and manufactures power transmission towers and telecom infrastructure. The international market contributes 55-60 per cent revenue. The companyÆs order backlog at FY18 end was Rs 173 billion, with around 70 per cent contributed by the transmission projects (including SAE Tower and substations) and 30 per cent from new businesses like railways, cables and civil. The power Transmission and Distribution business continues to be the largest business vertical which includes construction of power transmission lines on turnkey basis as well as construction of Gas Insulated Substations (GIS) and Air Insulated Substations (AIS) on turnkey basis. During the year, the T&D business secured orders of Rs 96.81 billion across both, domestic and international markets. In the domestic market, the company has successfully broadened its customer base to include private players who are setting up power transmission projects in India, as well as state electricity boards. On the international front, the company was able to achieve significant order intake from Brazil (through its wholly-owned subsidiary) and in the SAARC region. The company continued to receive order inflows from other geographies such as MENA and Africa. - Strong 18 per cent EPS growth over the next two years with stable 10 per cent margin. - KEC, over the past two years, has moved from being a mere TLT EPC contractor to a sub-station player now, thus improving its addressable market opportunity. - With strong impetus on T&D spend by select states and PGCIL, the bid pipeline for KEC remains healthy at Rs 120 billion over the next two-three quarters. - Moving up the scale, KEC is targeting higher ticket projects in railways EPC, solar and civil infra space, which could help the company clock higher growth. - Significant growth during the year. - Order intake more than doubled over FY17. - Growth led by state utilities and private clients. - Order intake from PGCIL almost at same level as FY17. - Substantial inroads in SAARC: around 40 per cent YoY revenue growth. - Successfully de-risked the Middle East business.